Gautam Soparkar, MBBS, DTCD, MD, MRCP(UK), FRCPC. Dr. Soparkar is an internist and specialist in breathing disorders, with a particular interest in sleep apnea and associated conditions. He has held clinical, research and teaching positions and has served as a program director for internal medicine residents. He has been an examiner for the Medical Council of Canada and the Royal College of Physicians and Surgeons of Canada. He is a preceptor for the Southwestern Ontario Medical Education Network, Schulich School of Medicine and Dentistry and an adjunct professor at the University of Western Ontario. 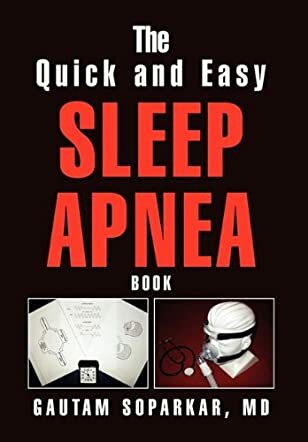 Gautam Soparkar, author of The Quick and Easy Sleep Apnea Book, focuses specifically on sleep apnea: the description, the diagnosis, and the treatment. This disorder is associated with high blood pressure and heart disease. Most people with sleep apnea snore and are overweight. The disorder can affect you throughout the day by causing you to be sleepy and feel as though your brain is in a fog. The American Sleep Apnea Association offers six questions to help you determine whether you need to be checked for sleep apnea. Soparkar discusses the three types of Sleep Apnea and uses illustrations to explain each. At the end of each chapter he reviews the main points. He describes a sleep study, its purpose and how one is conducted. He lists the lifestyle changes that can help with the problem: lose weight, stop smoking, avoid sleeping pills, avoid alcohol, and avoid sleeping on your back. While there are many ways to treat Sleep Apnea, a CPAP machine is the most effective. Gautam Soparkar takes the mystery out of sleep apnea. He uses simple and easy to understand terms as well as illustrations so that a layman can comprehend the disorder. This book is a fantastic resource tool for patients and physicians. I suggest physicians give their patients a copy of this book or at least recommend it. He clearly stresses that sleep apnea goes along with several other health risks.